This the second part of our series about some important considerations for Gibson and Fender pole piece spacing. Part one talked about things to consider for humbuckers. This section will cover things you’ll want to know when setting up instruments with single coil pickups. First, to review – the main focus of this series is to understand that there is a slight difference in the pole piece spacing between typical Gibson style pickups and Fender style pickups. By “pole piece spacing” we mean the amount of space in between the pole pieces of the pickups. This roughly relates to the spacing in between the strings of the guitar, but not entirely. More on this point later. If you were to measure the distance between the high E string and the low E string you would get different measurements if you were measuring a Gibson style pickup versus a Fender style pickup. When measured from center to center of the two outside (E) strings, a standard Gibson style pole spacing is right around 50 millimeters. A standard Fender style pole spacing is between 52 and 53 millimeters, depending on the pickup. Just like in part 1 of this series, the best way to proceed is to review the most common questions. Question 1: A soapbar is traditionally a Gibson style pickup, is there any way to get one with Fender spacing (F-spacing) instead? Yes. We actually make an F-spaced soapbar P-90. Currently we make them when ordered, so they are not on our web site. To order one you’ll need to call the shop and place your order by phone (206) 463-9838. The turnaround time for those is a week or two. We can build them in all of the different soapbar versions we make – standard wind, 50’s wind, and +5% overwound. Question 2: I want to put a soapbar into the neck of my Tele; will I need an F-spaced pickup? Probably not. Because the strings get closer together as you move from the bridge to the neck, in most cases a standard Gibson spacing will be fine in the neck position. (See question 4 for more detail). Question 3: I’m installing a 3-piece set of soapbar pickups into my Strat; do I need an F-spaced bridge? That would be a good idea. Read the discussion for question 4 for more detail. Question 4: I notice that the strings on my Strat line up differently over the pole pieces, is something wrong? This is an interesting question. 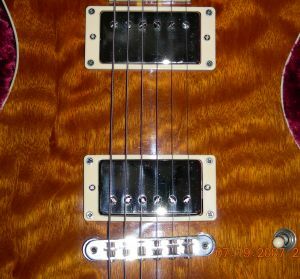 We discussed it in the previous blog, using humbuckers as the example. But since it applies to almost all guitars, it’s worth discussing using a single coil example also. As you know, the string spacing is the widest right at the bridge and the narrowest at the nut. So in other words, as the strings span from the bridge saddles to the nut, they become closer and closer together. Put another way, they are never quite the same distance apart anywhere along the guitar. They are either getting closer together as you travel from the bridge to the nut, or getting further apart as you travel from the nut to the bridge. That means the strings will always relate to the pole piece spacing of the pickups a little differently, depending on the position along the guitar. Notice how the strings and pole pieces line up a little differently at each different pickup position. The Strat is a perfect example. Take a look at this photo. If you look closely, you can see that closest to the bridge – where the strings are their widest apart – they actually sit a little to the outside of the two E pole pieces. If you travel down the guitar and look at the relationship at the middle pickup, you’ll see that the strings sit nicely centered over the pickup’s pole pieces. And if you travel even further toward the nut – as the strings get even closer together – you’ll see that the strings actually sit a little to the inside of the two E pole pieces. Like we mentioned in last week’s discussion, this is true in most instances. 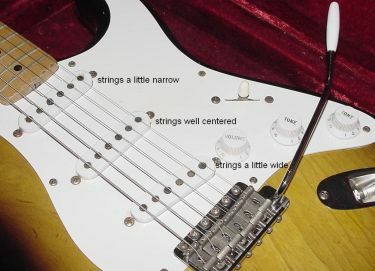 If the string spacing at the bridge is wider than at the nut, the strings will always relate to the pickup pole piece spacing a little differently, depending on the location on the guitar. We get enough questions about Gibson pole spacing versus Fender pole spacing that it’s worthwhile writing about here in our weekly blog. The best way to proceed is to review the most common questions. But first, we’ll start with some basics…..like, what do you mean by Gibson spacing and Fender spacing? That terminology is actually referring to the physical spacing between the pole pieces. This roughly corresponds to the distance between the strings themselves, but not entirely. (More on that point later). In general terms, the spacing between pole pieces is slightly wider on Fender style pickups, and slightly narrower on Gibson style pickups. 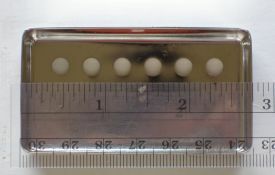 The overall difference – when you measure from the centers of the 2 outside pole pieces – is roughly 2 to 3 millimeters. In other words, if you measure from the center of the high E pole piece to the center of the Low E pole piece, a Gibson spaced pickup will measure right around 50 millimeters. A pickup with Fender spacing will measure between 52 and 53 millimeters, depending on the pickup. Question 1: How wide is the Fender pole spacing and how wide is the Gibson pole spacing on the Lollar Imperial humbuckers? 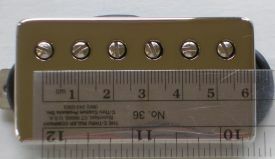 A standard Lollar Imperial humbucker has a pole spacing of about 50mm. Our traditional Gibson style Lollar Imperial humbuckers have a pole spacing of about 50 mm, as measured from center to center of the two outside pole pieces. The Fender spaced Lollar Imperial humbucker has a pole spacing of about 53mm. 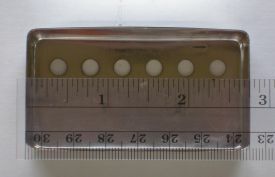 Our Fender spaced (F-spaced) Imperial humbuckers have a pole spacing of about 53 mm, as measured from center to center of the two outside pole pieces. Question 2: Will I need a longer route if I install a Fender spaced humbucker? The outer dimension of all of our (six string) full sized Lollar Imperial humbuckers is exactly the same. The difference between the two pickups is in the spacing of the poles as they’re positioned on the inside of the pickup. In other words, when a metal humbucker cover is machine stamped, the outer rectangle or “box” is the same size. But it’s the distance in between the individual pole pieces that is different. They are stamped through the metal box in slightly different positioning. This Gibson spaced humbucker cover is 2.75" in length. Take a look at these two photos. You’ll see that the outer dimension of the two humbuckers is exactly the same, even though they each have a different pole spacing. This Fender spaced humbucker cover is 2.75" in length. Question 3: How do I know if I need Fender spacing or not? This is one of those questions that – to a certain degree – needs to be answered on a “case-by-case basis.” But that being said, generally speaking, if you are purchasing full sized Lollar Imperial humbuckers for a standard Gibson style guitar, then it’s not an issue. You need standard Gibson style humbuckers. 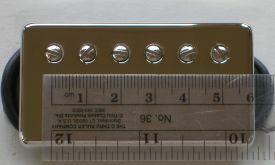 However, if you are installing humbuckers onto a guitar that could be considered a “Fender” style guitar, then you’ll want to evaluate the need for a Fender spaced bridge. The most direct approach is to start by measuring the string spacing, right at the bridge. Question 4: I want to set up my strat with an S-S-H (single-single-humbucker) configuration. Do I need an F-spaced Imperial bridge? Yes, in most cases. The only exception to this would be if – somehow – a Gibson style bridge had been installed onto a Strat style guitar. That would be more of a “fluke” than anything else. Say, for example, a home-made “Frankenstein” guitar made from parts you happened to have on hand. As far as we know, there are no Gibson style bridges being installed onto Fender style guitar modifications or “clones” of any sort. Question 5: Do I need an F-spaced Lollar Imperial for my Tele neck? Probably not. Most of our players, and builders, install a standard Gibson spaced Imperial humbucker in a tele neck. As you know, the string spacing itself becomes narrower as the strings span from the bridge saddles to the nut. Even though it’s a Fender style guitar, the string spacing at the neck position can usually accommodate a standard Gibson spaced neck pickup. Question 6: My pole pieces don’t line up exactly under my strings, is that a problem? This is actually completely common for standard guitars. If you think about it, the strings are never the same distance apart as they span from the bridge to the end of the neck. They are furthest apart at the saddles of the bridge, and closest together when sitting at the nut. In between, they sit at various distances apart. That means no two positions on the guitar will relate to a pickup’s pole piece spacing in exactly the same way. Notice how the stings align a bit differently over the tops of the humbucker pole pieces. Take a look at this photo. If you look closely, you’ll see that when the strings are closest to the bridge, they actually sit a little wider than the pole pieces of the humbucker pickup. Now take a look at the strings’ position further down the guitar, when they are sitting over the neck pickup. Notice how the strings sit a little more closely aligned with the humbucker pole pieces. This is true for all guitars: If the string spacing at the bridge is wider than the string spacing at the nut, the pole pieces and strings will line up a little differently at each pickup position. To learn more about our various types of humbuckers, follow this link to the Lollar humbucker section of our web site. Next week we’ll talk about how to apply these same ideas to projects with single coil pickups.